I don’t know about you but when I was growing up we had two egg options: brown and white. It didn’t really matter what we bought because they were all around the same price. However, things have changed and they have changed drastically. (Thank goodness I discovered Handsome Brook Farm!) Buying eggs each week is confusing – what do all those labels mean? To make things easier, I decided to always purchase the most expensive eggs. I assumed they must be the healthiest with the most humanely raised chickens and hens. I quickly realized how crazy this was and decided to stop guessing and do a little research. After all, this is something I am purchasing every week and I can’t be the only one who feels lost in the egg game, right?! I wanted to educate myself about eggs and take the guesswork out of it. What I discovered was quite shocking. I found out those labels are a big deal and some of them can be quite misleading. For instance, cage free sounds nice, doesn’t it? I’m sure if you close your eyes and picture cage free chickens you see chickens and hens roaming around in a cute little barnyard – wrong. While cage free is technically better than commercially farmed (hens and chickens that spend their entire lives in cages the size of a small drawer), it still isn’t the best. Cage free chickens and hens are raised in tight, dark spaces with little exposure to sunlight. There is no life in the barnyard for them. 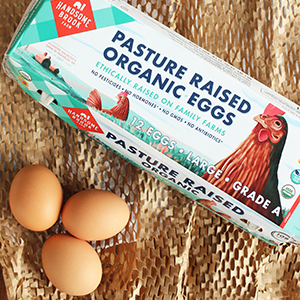 When you’re purchasing eggs, look for pasture raised. This label represents those chickens and hens that are truly free to roam in the pastures and bask in the sunlight. Aside from their living conditions, you ought to be extremely concerned with what the chickens are eating. After all, you are what you eat and if your chickens aren’t getting proper nutrients those eggs you are buying aren’t as healthy as you think. At the grocery store, you will see many eggs advertised as vegetarian fed. This is also extremely misleading because chickens are not meant to be vegetarians. To be at their healthiest they need to eat protein, which they mostly get from consuming insects in the barnyard. A chicken’s diet should be a mix of grass, bugs and other natural fare. Always look for organic on the label, this ensures that your chickens aren’t being fed hormones or antibiotics. Our friends at Handsome Brook Farm believe that the happier and healthier the hen, the tastier the egg. (SO TRUE!) Their chickens and hens are pasture raised where they have the freedom to roam, nest, flap their wings, bask in the sunlight and take dust baths. While many farms have over 40,000 birds living in each barn, Handsome Brook Farm has 400 hens per acre which is an enormous difference. The animals live on a steady diet of grass, bugs and supplemental feed provisions that were specially formulated by poultry nutritionists. Their feed consists of corn, wheat, alfalfa, oyster shell, trace minerals and a small percentage of soymeal for protein. Handsome Brook Farm pasture raised eggs are packed with all the nutrients you’re looking for – the yolks are bright with thicker whites and a richer taste. Pasture raised chickens produce eggs with lower fat and cholesterol, more vitamins and higher levels of omega-3 fatty acids and carotene. As a bonus, you can eat these eggs with a clear conscious knowing the chickens and hens were treated with care and respect. We put Handsome Brook Farm eggs to the test and whipped up Easy & Impressive Back to School Baked Bacon, Egg + Fruit Breakfast Pastries. We found out it’s true, everything is better when it is farm fresh! Find Handsome Brook Farm Eggs near you here! Lots of love to Handsome Brook Farm for sponsoring this post! It is partners like this that make documenting our journey possible. We put Handsome Brook Farm eggs to the test and whipped up Easy & Impressive Back to School Baked Bacon, Egg + Fruit Breakfast Pastries -- it’s true, everything is better when it is farm fresh! Heat the oven to 400 degrees and cut the puff pastry into squares (large enough to fit a small baking ramekin on top). Line a baking sheet with parchment paper and evenly space the puff pastry squares on the sheet. Put a baking ramekin in the center of each puff pastry square (if you don’t have enough ramekins for each puff pastry square you will have to bake in batches). Allow half the puff pastry to bake for 5-6 minutes and half to cook for 10-12 minutes. The half that cooks for the lesser baking time should not brown at all. The fully cooked puff pastry will be used for the fruit tarts, set this batch aside once golden brown. Once the half-cooked puff pastry is done, crack an egg into each indent and top with cooked bacon and Parmesan cheese. Place back in the oven for another 7-8 minutes or until the eggs have set. CAUTION: Do not over-bake the eggs or they will harden and become inedible. Top the egg and bacon pasty with parsley and salt and pepper. For the fruit tarts, make the custard. In a medium saucepan, combine sugar, flour and salt. Slowly whisk the milk in until smooth. Bring the mix to a light bowl over medium heat; whisk constantly. Boil until the mixture thickens and remove the pan from the heat. Whisk the egg yolks in a separate bowl and slowly whisk in the hot mixture. Place the eggs and hot mixture back into the saucepan and whisk constantly until the mixture thickens; remove from heat. Add the butter and vanilla and strain the custard through a sieve over a bowl. Place plastic wrap directly on the surface of the custard (this will keep skin from forming) and refrigerate for one hour. Place the custard into the cooked puff pastry and top with fruit.